When visiting Cape Town the first thing anybody notices is the mountain. It is 1085 metres high and on the right of its flat top is a little knob. It looks like a pimple from far but once you get closer you will see that it is the upper Cable Way Station. Not only is Table Mountain famous for its views but for the many species of plant and animal that live on it. In all there are 1470 species of plants growing on it. More or less the same number as can be found in the whole of the United Kingdom. 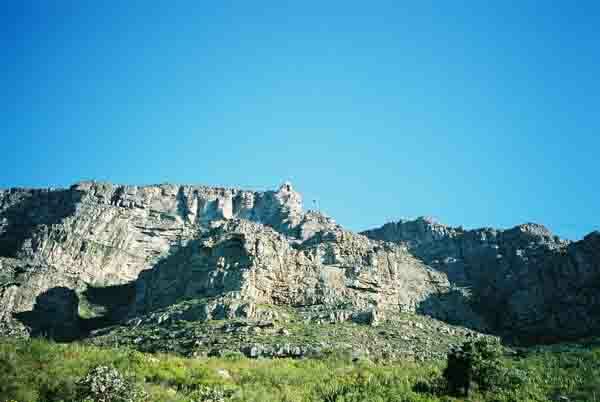 However, Table Mountain is not only home to plants but also a number of wild animals such as the Dassie (Rock Rabbit) grysbok, caracal, mongoose, and baboon. Found in this mix is another animal which is not South African but actually Indian. It is the Himalayan mountain goat or Tahr as it is called here. It lives on the upper reaches of Table mountain and is aggressive and territorial and does not cohabit with the other local antelope found on the mountain. 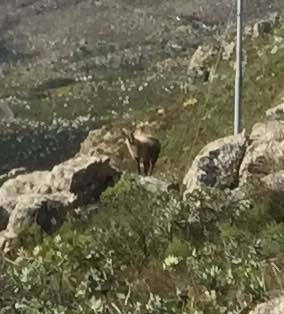 A strange thought I guess, a Himalayan mountain goat on Table Mountain. The tahrs came to South Africa at the turn of the century (1900s) and were introduced by Cecil John Rhodes. They lived in a zoo until 1936 when they were released in Cape Town and found their way on to the mountain. Thay have been up there for more than 70 years now. Cape Nature Conservation officials have decreed that the tahrs endanger the local plant life on the mountain as well as the antelope that are endemic to Cape Town and so have to be removed. In the process of eradication of the tahr which started in May 2000 approximately half of the population has been killed. This has caused a furore as the nature lovers in SA believe that as the animals have been here for more than 70 years they should be allowed to stay. The good thing is that the killing has stopped for the present. The tahr has nearly become extinct in the Himalayas and there is a small population of them in New Zealand. There are a number of plans to try and rescue the last of the Cape Town population. One of them is to catch all the remaining tahrs and relocate them to the Himalayas. The big problem with this idea is of course, finance, followed by a second but just as difficult one, the capture of the tahrs. If anyone knows Table Mountain and what the sandstone cliffs look like then you will appreciate the difficulty one will have in capturing them on the slopes of the mountain. It has been proposed that a helicopter and net be used in the capture of these hardy animals. Not only is the idea extremely dangerous but the chances are that the nets dropped by a helicopter could knock the tahr off the cliffs and to its death far below. Once captured in a net officials would have to climb down the rock faces to retrieve the animals as well. The Utah helicopter company that has agreed to assist in the capture of these tahrs has captured and relocated the tahrs in New Zealand as well. There is still another problem facing the Friends of the Tahr and that is that the moratorium on their slaughter expires on October 1st 2003 when the killing will begin again. If anybody out there can assist with donations to cover the $90000 cost of relocating the tahrs I am sure people here in Cape Town would be most appreciative. Since the change of government in 1994 there have been many changes and one of them is that aliens which include trees plants and people who do not belong here have to be removed. Good or bad? I don't know. To find out more you can visit the following websites. Its now June 2004 and the Tahrs are being destroyed. Hunters have been called in from the Kruger Park and elsewhere and are shooting the Tahrs on Devils Peak. It's such a pity that an animal that has lived on Table Mountain for so long has to be removed. The tahrs have been eradicated from Table mountain after much hue and cry by the residents of Cape Town. In their place the klipspringer buck has been reintroduced. I know that a number of Tahrs still exist on the mountain as I have received correspondence from my readers with photos. Don't make a fuss if you see them. Enjoy the sighting of them and leave them be.